"Look into my eyes, you will watch The Grammys, you will watch The Grammys". 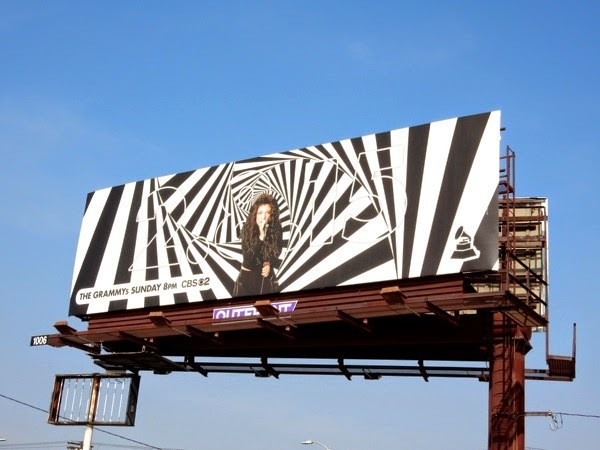 This year the 57th Grammy Awards outdoor ad campaign celebrates 'The Grammy Effect', with these hypnotic geometric designs enticing you to watch the live broadcast on February 8, 2015. 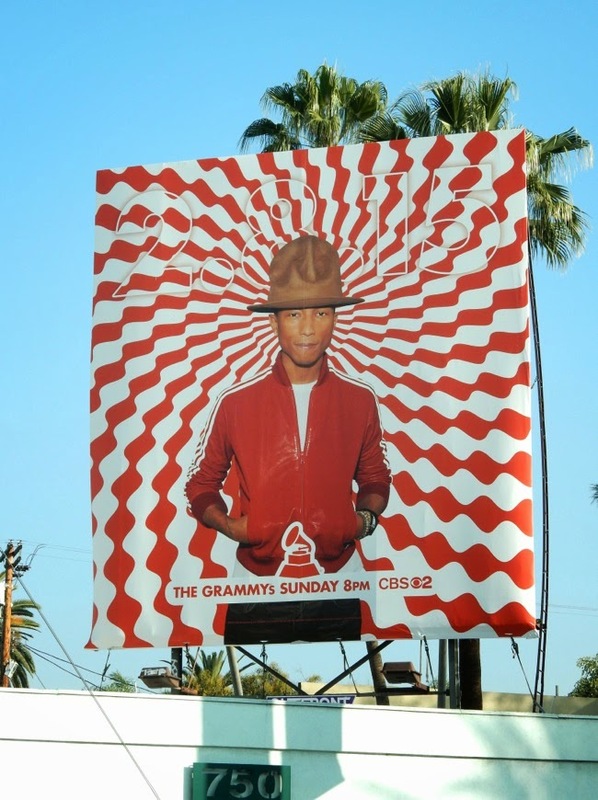 Lorde, Pharrell and Beyoncé (they don't need a surname to clarify who they are) all radiate star power in these eye-catching ad creatives, just as much as they did performing on stage at previous Grammy Awards ceremonies, or making an entrance on the red carpet in their over-sized hat. 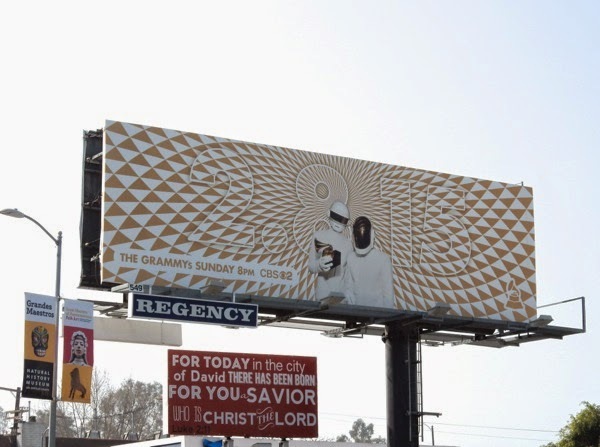 These vibrant Grammy billboards were spotted along Sunset Boulevard, Melrose Avenue and Highland Avenue from January 15 to January 21, whilst the 57th Grammy nominees album billboard was snapped along the infamous Sunset Strip on January 24, 2015. 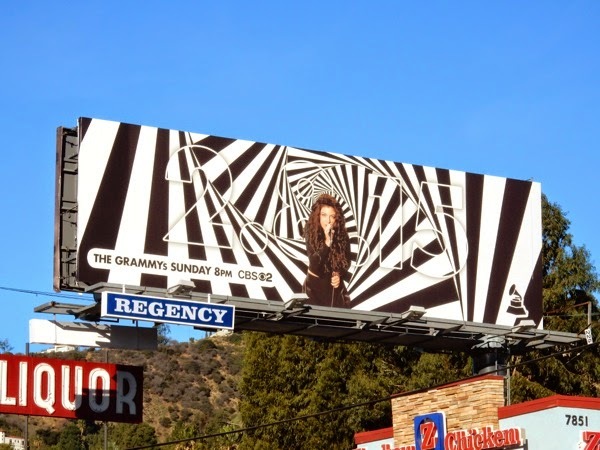 The music industry awards show outdoor advertising is always inventive, but these new creatives are probably Daily Billboard's favourite ad campaign to date, but be sure to compare them to previous Grammy Awards billboards from years past and see what you think. 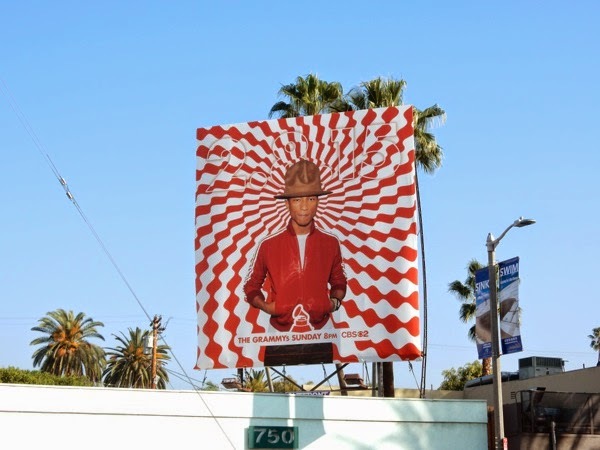 If you're a fan of the singing style-setter Pharrell Williams, be sure to also enjoy these billboards for The Voice's seventh season. 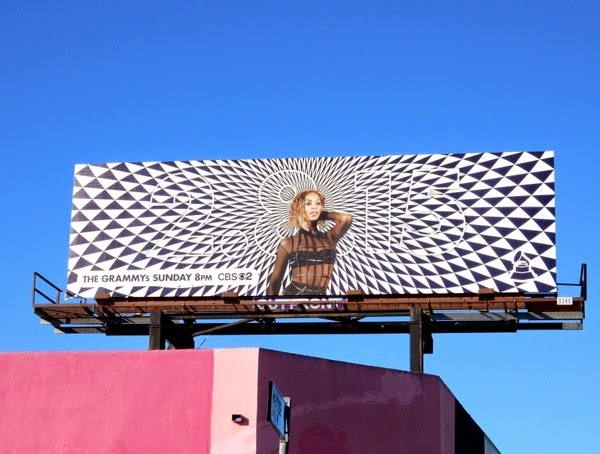 If Queen Bey rocks your world, make sure you check out all these billboards featuring Beyoncé, everything from other awards shows to concert tour promos, behind-the-scenes documentary films and being the face of Pepsi. 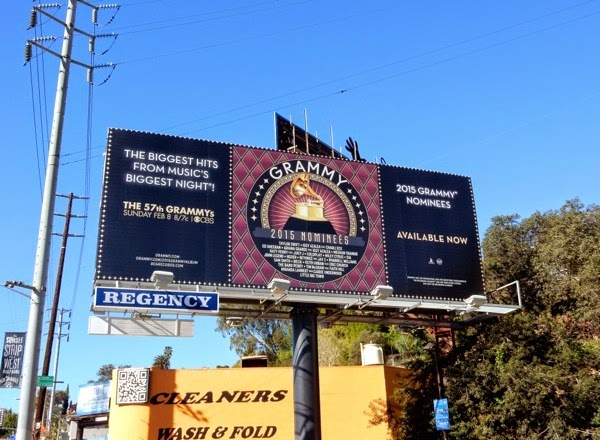 Which music superstars and recording artists will walk away with a Grammy this year at The Staples Center in Downtown L.A.? You will tune in to find out. 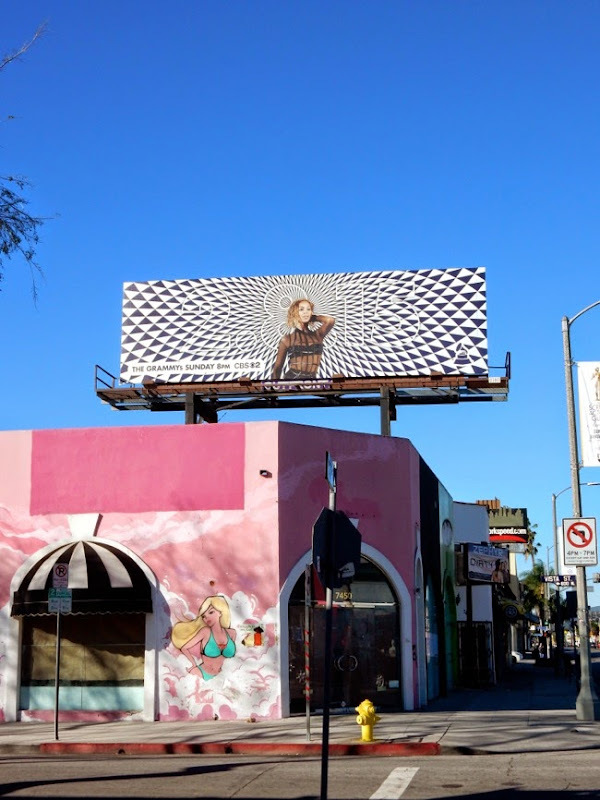 UPDATED: Daily Billboard spied another of 'The Grammy Effect' ad creatives, this one featuring French electro-pop duo Daft Punk, along La Cienega Boulevard on February 4, 2015. 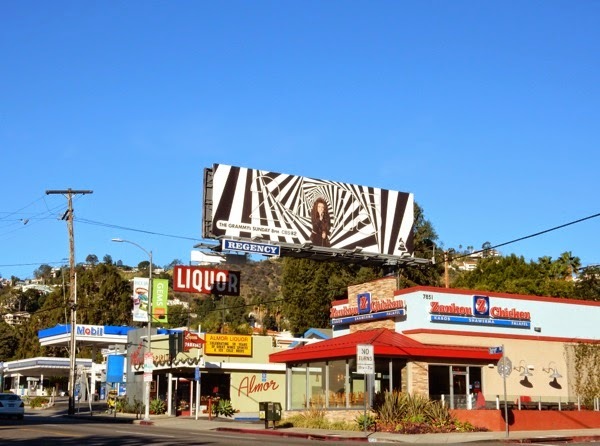 Across the highly trafficked road was a companion billboard in better lighting featuring New Zealand singer, Lorde. 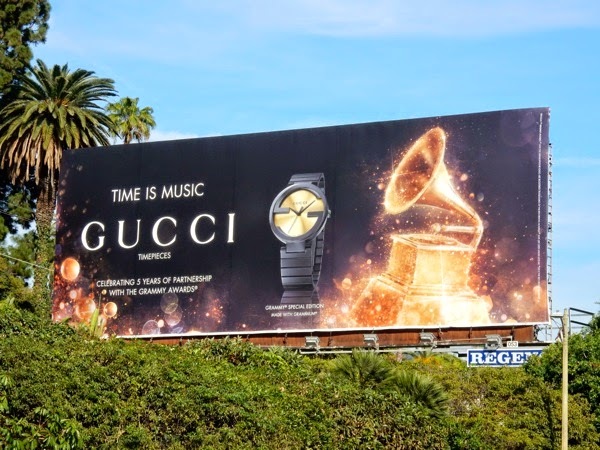 Meanwhile along the Sunset Strip on February 2, 2015, Gucci Timepieces were celebrating five years of sponsorship partnership with The Grammy Awards with this eye-catching golden Grammy billboard.